For more than 63 years, Aaron's Gold has been New Jersey's premier gold dealer. We buy and sell gold, along with other precious metals and estate jewelry. Our family-owned shop offers the highest prices on an extensive variety of items, including jewelry, coins, gift cards, smartphones and much more. Give us a call to learn more about what we buy. Call (201) 823-1720 today. 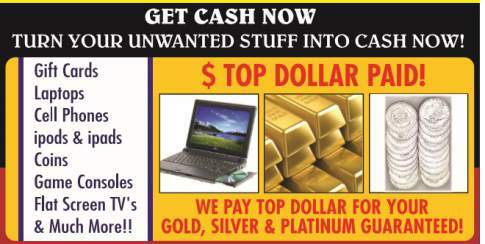 Trade your gold, jewelry, gift cards or other precious items for cash. We pay top dollar for your old gold or unwanted items. Our knowledgeable team is ready to assist you with your transaction. Call (201) 823-1720 for details.